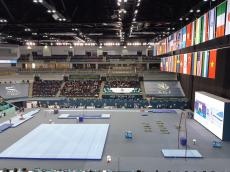 The winners of the FIG Artistic Gymnastics Individual Apparatus World Cup in horizontal bar exercises were named in the National Gymnastics Arena in Baku, Trend reports. Gymnast from the Netherlands Epke Zonderland scoring 14.633 points ranked first, Croatian gymnast Tin Srbi? scoring 14.600 points ranked second, Swiss gymnast Oliver Hegi scoring 14.366 points ranked third.